Books, Writing, Drawing and Life on a Remote Island. Groote Eylandt – One for the Ladies! What do you get if you put 84 ladies, a fishing competition and one of the most spectacular fisheries in Australia together? A whole lot of fun, some impressive fish and a seriously hot competition for all. 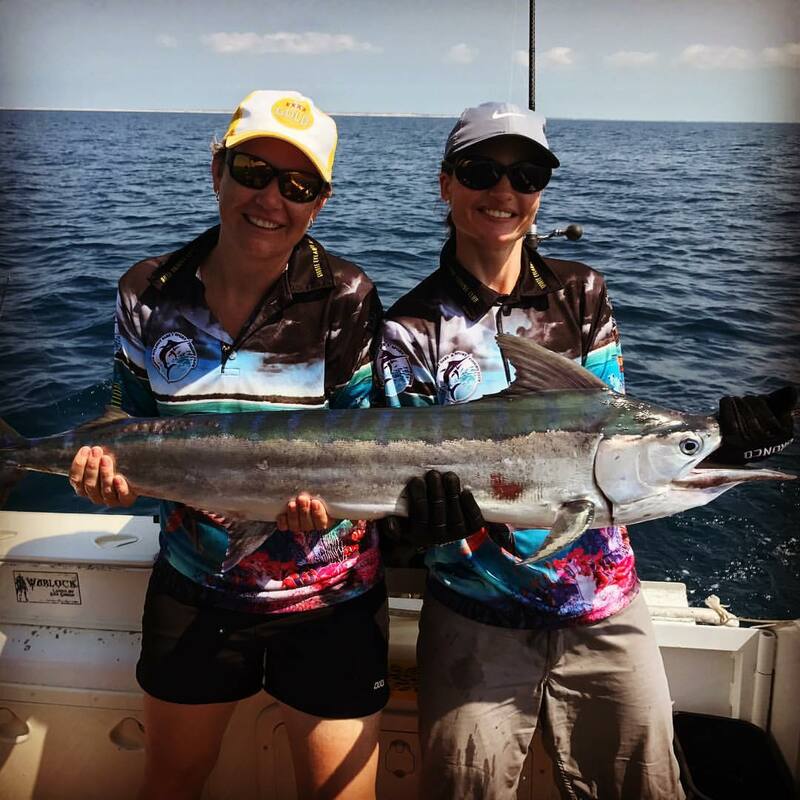 Groote Eylandt Game and Sport Fishing Club’s Ladies Competition has been running now for seven years. I have been lucky enough to participate in the last five of them. Each year the competition gets bigger and better – it peaked in 2016 with 127 ladies taking part. Not bad for a tiny remote town with a population of approximately 1000 people in all, hey? ‘Best Photo’ winners – Kiss our Basses! For me, and many other ladies who live on Groote, it’s one of the highlights of the year. It’s an event that gives us girls an excuse (and a push) to leave behind the cares of daily life for a day or two and get out on the water amongst some awesome fishing and scenery. A lot of people know that I love getting out on the water. I love fishing. I love the time I get to spend with family and friends on the boat, out in the rivers and on the sea. I love emerging myself in the spectacular environment that Groote Eylandt has to offer. Of course that’s all great, but what I particularly love this time of year is seeing those who are new to fishing, or who simply can’t get out there much, giving it a go and having an amazing time and lots of laughs in the process. Over the years, I have encouraged ladies to enter the competition, only to have that hesitant, ‘Oh, but I don’t fish…’ come back in reply. Those that go ahead and enter anyway have always come back afterwards glowing – and no, it’s not sunburn. There’s a happy (and sometimes newly competitive) glint in their eye, and a determination to do it all again next year with a new understanding – it’s not just about the fishing! Perhaps even more important is the company and camaraderie we get from hanging out with the girls, skippers and support crews (dads, babysitters, partners and bar tenders) who all have one goal in mind. Fun! It helps that Groote has some of the best fishing in Australia (well, I think so). This year, our team caught 20 different species, from golden snapper and nannygai, to barramundi and barracuda. Tuna, mackerel, shark, mangrove jack, cod, blue nosed salmon and plenty more were hooked. And some were not, despite a fair bit of effort and a few comic errors. At least no one fell overboard this year, but I have never before put so much effort into trying to catch a batfish (with no success) or a sea mullet (yay! Caught that one). It’s not just about the spectacular prize-fish people usually target… that batfish would have been worth an equal number of points to a barramundi. That’s another reason I love this comp. Well done to all the girls who entered, from Kelly, who caught a spectacular black marlin as big as her boat, to Lou who caught her own finger (ouch!). They both have the photos to prove it. The presentation night was also a highlight for many who brought along their fishing shirts and dancing shoes and danced well into the night. Unfortunately, that’s it for another year. Now we are left with sore feet, fantastic memories, photographs… and a countdown to the next one. *Do you have a local event that you look forward to every year? I’d love to hear about it… leave a comment below. All photos courtesy of GEGSFC Facebook page, Melainie Collins, or own collection. *Thanks to the GEGSFC and all the organisers, especially Melainie Collins – without whom there would have been no event. Liked this post? Sign up below to receive email notifications. Crazy Lady in the Book Shop! What’s it like to see your books in shops? This is a question I have been asked a few times since my children’s picture book, There’s a Crocodile on the Golf Course, was released earlier this year. The answer… it’s pretty darn exciting! Seriously, perhaps it’s because it’s still a bit of a novelty, but I never get sick of seeing my book on a shelf. It is a buzz to see a book you’ve worked on sitting there alongside other books by amazing authors… people whom I have always admired. I doubt it would ever get old! Alison Lester… the next shelf up! For full disclosure, I’d love to be the cool and collected type, but I’m just not. In truth I consider myself a bit of a dag – even at the best of times. I have just returned home from a trip to Darwin for a publishing forum and workshops run by the NT Writers Centre and NT Library (more on that another time), and popped into The Bookshop Darwin and Crocosaurus Cove, who are both wonderful stockists of my book… just to visit my books on the shelves. Signing at The Bookshop Darwin. Of course, I am touching base with the store managers and staff too. And it’s exceptionally lovely to browse the shelves of a real-life bookstore, something I don’t get to do often, living on a remote island. But also, I just love visiting my books. My great friend, Steph, has opened a new restaurant, Spice Garden, in Nightcliff, Darwin and asked to stock a few copies of my book alongside some others she has on display. ‘Well of course!’ I said, then promptly went in for a selfie! Happily, Steph was keen to join in! I’m not overly big on selfies, I was probably just born too early, but for my books I will make an exception. I am sure that store staff generally think I’m a little crazy, but they are great sports and allow me to come in and make a glorious fool of myself attempting to pose for inconspicuous selfies that are absolutely not inconspicuous. They try to supress their smiles sometimes as they walk by politely. Other times they just laugh along with (or at) me. Fair enough! Come to think of it, this happens in libraries too. I get the strangest sideways glances from other customers, but that’s ok. I’m too daggy to care. I’ll never tell you this, of course, but even when I am home on Groote, I will pop into the shop occasionally just to peek at them. Of course, I love catching up with the lovely Sandy who runs the Alyangula Newsagency and Kiosk, but I’m sure she suspects my motives sometimes! So, there you go, the jig is up, the secret is out. If you see me posting a selfie or two with my books, please be tolerant! Just roll your eyes and laugh along. I’m not really crazy. I just can’t help but get excited… it’s a buzz. And I’m more than happy to look like a dag for that! You know I live on an island, right? Groote Eylandt. Did you know that this island is in one of the most remote areas in Australia? Did you know that it is a phenomenally stunning place full of tropical, white sandy beaches, year-round warm weather, amazing culture and Australian native wildlife? So where do you go when you live in such a place and you’re in need of a luxurious break… but you only have the weekend? How about 400 metres down the road? Yes! My family and I just had a mini-break for the weekend, about 400 metres down the road from our house at the Groote Eylandt Lodge. And I tell you, I’d recommend a 400-metre-holiday to anyone. At first it felt a little strange. Hubby and I drove down the road with our bags, making jokes about the long drive. We got out and checked in to our hotel, less than a kilometre from our own front door. I mean, the canapes on arrival were set up beautifully on the outdoor deck, and we were surrounded by people who we knew (such a tiny town!) who had come down for Friday drinks. Yes, jokes were cracked at our romantic dinner for two (I think that was mostly my husband), but it was lovely sitting there, on the deck, watching sugar gliders in the trees as we ate our seafood canapes and drank our complimentary bubbly. It didn’t take long to feel like we were much further away from home than we really were. It also felt a little strange heading back to our bungalow instead of walking the short distance home after dinner, but then the huge spa made me forget all about my own spa-less bathroom up the road. And the thought of uninterrupted sleep for a whole night (don’t forget, I’m the mother of small children) was just the trick to make me relax into our 400-metre-holiday in no time at all. Soon we were sitting on the deck in front of our room, watching the bandicoots fossicking and the tawny frog mouth that landed less than a metre from us on the rail keenly looking for its own dinner, remarking how lucky we were. The next day, getting up without a 5am-alarm-child in my ear and ambling through the resort to the restaurant-with-a-view for our full cooked breakfast was wonderful too. And then I got to write… on the deck, overlooking the sea… for two whole hours! Yes, it was to be short lived… the kids were joining us that day. Come on, there was no way they would let us have both nights to ourselves… they need holidays too! (In truth, I was having withdrawals from their rowdiness.) But sitting there for that short while, was bliss. The kids bowled on in around lunch time and set about exploring (dismantling) our room. Hotel rooms are super exciting! After that it was time to hit the pool, and we literally spent the whole afternoon just hanging about the deck, swimming (CANNON BALL!) and taking in the phenomenal view which we felt like we had all to ourselves. And it is an amazing view, especially on dusk as the sun sets over the sea and nearby Connexion Island. The photos seriously don’t do it justice. Now, I know you might be thinking… but you can visit the Groote Eylandt Lodge and that beach any time. And that’s why, at first it did feel a bit strange to take a holiday just down the road. If we had not been lucky enough to win the accommodation in a raffle, I might never have done it – thinking just that. Yes, I CAN visit that beach any time. But, the reality is… I don’t do it enough. This beach is a 5-to-10-minute walk from my home, and yet I don’t clearly remember the last time we visited. Hey, day to day life can get in the way of that type of thing. Chores, errands, kids, life. It’s distracting. Even if it was only 400 metres away, this little break did well to remind me to ‘look up’. To remember what I have right here on my doorstep. Surely, this doesn’t just apply to Groote? If you haven’t been to Groote Eylandt, look it up. I reckon it should be high on your list of travel destinations. There’s a stack of things to do that the Groote Eylandt Lodge can arrange. If you are lucky enough to live here, like me, remember… not all places are this stunning. Not everyone gets to see this. Don’t forget to look up and take it all in. What’s the best thing you have ever done as a tourist in your own town? Check out my book There’s a Crocodile on the Golf Course here. As promised, here are a few pics from our Book Week parade. My son went as the blue crayon from ‘The Day the Crayons Quit’. It is a fantastic little picture book by Drew Daywalt and illustrated by one of my favourites, Oliver Jeffers. My boys love it! There were so many fantastic and creative costumes on the day… I’m sure this was the same at schools and events all around the country. Among the costumes, too numerous to mention individually, were Captain Underpants, Thing 1 and Thing 2, Sharks, Dragons, Hermione, Pirate Princesses, Pig the Pug, Mr Strong, the whole cast of Who Sunk the Boat, and even a treehouse from Andy Griffiths current bestseller. There were superheros and a few awesome Paperbag Princesses. I have to give kudos to the teachers who also looked fantastic in their costumes… I think that would have warranted a parade all on its own! Maybe next year? I had a lovely surprise when Miss C. took to the stage dressed as Croco, from my picture book, There’s a Crocodile on the Golf Course. How special! The costume was spectacular… Miss C. must have spent a lot of time creating her costume and she looked amazing. She even won a prize! Don’t forget about Australian Reading Hour on the 14th of September. I’ll be picking up a book or two for an hour… how about you? Crocodiles, Hats and Book Week Fun! Book Week fever hit far and wide in Australia last week. Facebook was full of kids dressing up in their favourite characters. Obviously a lot of thought has gone into some of the costumes… and I bet there are a lot of worn out parents who helped their kids look so fantastic for Book Week events. Home-made, store bought, thrown-together-at-the-last-minute, or planned-for-months… I salute everyone who got involved! Mr C. as ‘Fly Guy’ and Mr W. as Croco! I was excited to receive these photos, sent to me all the way from South Australia. Mr W. dressed up as my favourite crocodile — Croco from my book, There’s a Crocodile on the Golf Course ! I never imagined one of my own characters being brought to life for Book Week! It’s pretty special! Here in Alyangula, I am looking forward to Friday morning, when our Book Week parade will be held. Seagrass Early Learning celebrated last week, and I was lucky enough to join in the reading sessions with some of the other parents. I even got to dress up myself, inspired by the picture book I Got This Hat by Jol and Kate Temple. It was fun trudging through the Centre with hats pinned all over me, though it didn’t last long. One by one they fell off… I suspect my costume was a little rushed. At least the kids had fun trying on the hats! My son was keen for me to come and visit. He chose about ten books for me to read… in the end I managed to read three or four before I was puffed out and it was someone else’s turn. Some of the favourites were Do Not Open This Book by Andy Lee and What do they do with all the Poo from all the Animals at the Zoo? by Anh Do. A bit of a tongue twister, but super funny! Thanks to the Seagrass team for hosting the event. I had a great time! Looking forward… Have you heard about the Australian Reading Hour? On Thursday, September 14th all Australians are encouraged to pick up a book for one hour and read, either by themselves or with their children. I don’t need an excuse to pick up a book for an hour, but in case you’re hesitating, the benefits of reading for children and adults are massive. For more information on this fantastic initiative or to register for the event, click here to visit the website. P.S. I will try to remember to post some pics of my son’s book week costume later! He worked hard to make it himself… with just a little help from Mum! As promised, here is the information about another competition to celebrate the official release of ‘There’s a Crocodile on the Golf Course’ along with our Book Launch and Family Fun Day on 12th of February! As part of our celebrations we will be holding a colouring competition for the kids. You can pick up the colouring sheets for the competition from The Alyangula Golf Club, Seagrass Early Learning Centre or by clicking on this link to download it here and print your own! Book Launch Colouring Competition Print Out! There will be different age categories and also an opportunity for kids who don’t live on Groote Eylandt to win with their own category! For details on the colouring competition and more, CLICK HERE. Entries need to be returned to the Alyangula Golf Club or Seagrass Early Learning by Friday 10th of February at the latest to be in the running to win some great prizes! You can download the printout as many times as you like, but please choose your favourite to enter as there is a limit of one entry per child. Our judges decisions on the winners will be final and winners will be announced at the Launch on 12th of February as well as on our website on the same day. Get colouring kids! Cant wait to see you there. Well, I am back from a very relaxing family holiday and it is time to start thinking about celebrating the release of “There’s a Crocodile on the Golf Course” with our Alyangula Book Launch and Kids Fun Day! To help us celebrate we will be holding a Best Dressed Competition for the kids on the day. Come as your favourite character or animal from the book and participate in the costume parade to be in with a chance to win a prize. 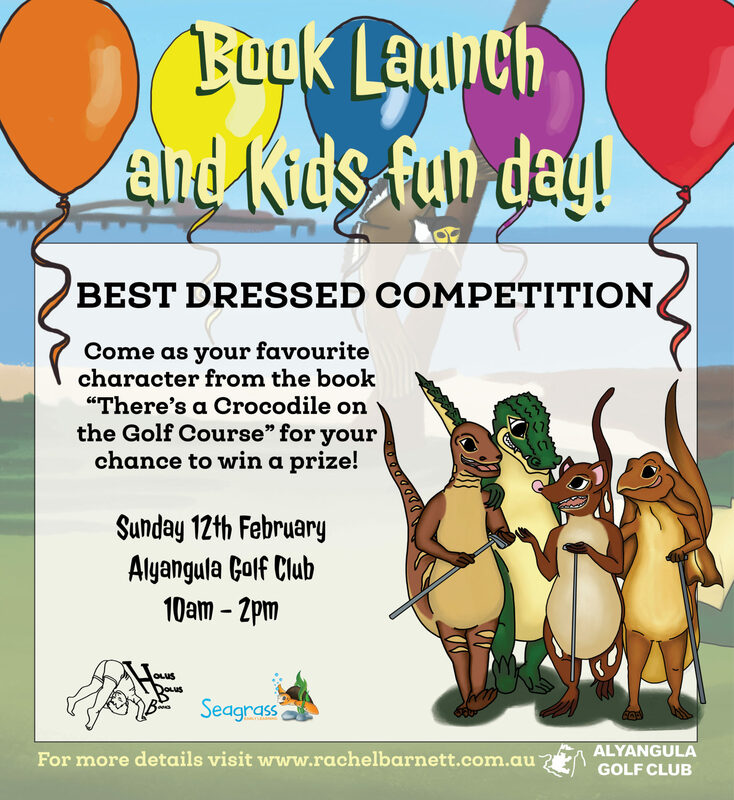 Come and join the fun at the Alyangula Book Launch for “There’s a Crocodile on the Golf Course”! For further details, Check our BEST DRESSED COMPETITION Page. The 12th of February is coming up fast! To RSVP for the event, visit our Facebook Event HERE. Get creative kids! I can’t wait to see you all there! Book Launch and Kids Fun Day – Save the Date! 12 February 2017! Save the date! I am so excited to finally be able to share the details around the official Alyangula book launch event for my picture book, “There’s a Crocodile on the Golf Course”! The event will be held at the Alyangula Golf Club, naturally! Croco won’t have to venture far to join us (though the real crocodile can stay away, please) and there will be plenty of activities and fun to be had for everybody! I will create a Facebook Event (check out / follow my Facebook page – Rachel Barnett – Holus Bolus Books for details) to keep everyone updated on activities and competitions for the day and will also post more information here as the date gets closer. Please put it on your calendar and come and help me celebrate if you can. Croco and I would really love see you there! I have been having a very relaxing time whilst seeing in the New Year here on Groote! Hopefully you have too? I just wanted to let everyone know that I will be posting and delivering books on Wednesday 4th and Thursday 5th of January and then there will be a delay in availability for a few weeks. Books will become available again the week of the 23rd of January. You can still put in an order and these will be filled as soon as they are available again. So, if you still want to order and need to get your book asap, you will need to put your order in quick! To order now, CLICK HERE. 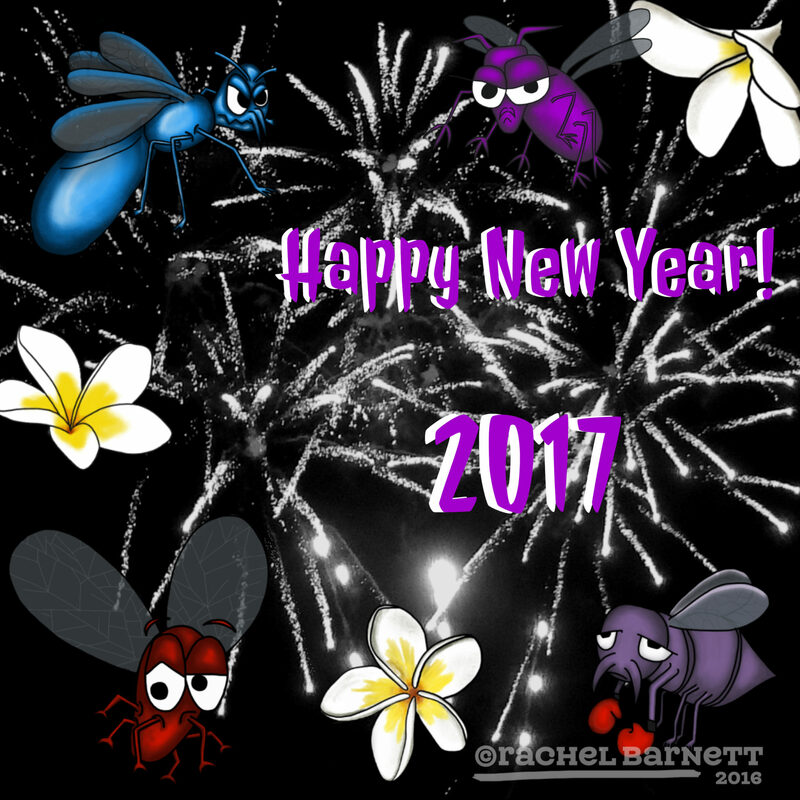 Happy New Year to all… I truly hope that it is a great year for you and your loved ones. PS. News about the official book launch for There’s a Crocodile on the Golf Course will be coming VERY soon! Keep your eyes peeled. A visit from the big man in red – and some gratitude. I live in a very remote part of Australia. For those that don’t know, I live on Groote Eylandt, which is a small island in remote Northern Territory. The only real way to get here is by plane, and everything we have has to be flown or barged in. Alyangula itself, which is where I live has a population of about 1000 if we are lucky. It is a small town, and mostly filled with people who come here for work, whether for the mine or government employment or one of the various other enterprises that base their workers in the town. I am very lucky that I have some family living here, but I am mindful that for the majority people living in Alyangula the distance from family and friends is great. This can be a difficult thing for the families of this town, particularly at this time of the year when the holidays are upon us, and the emphasis on the importance of family and loved ones can make it feel like we live on the edge of the earth. Which is why I wanted to do a bit of a shout out to the events for children and families that are run in this little town. Take this last weekend for example. On Saturday afternoon the Alyangula Children’s Christmas Party was in full swing. It involved an amazing itinerary including a disco, free food (including the favourite – Fairy Floss! You should have seen the line! ), face painting and tattoos, Santa Singers and a visit and presents from the big man in red himself. 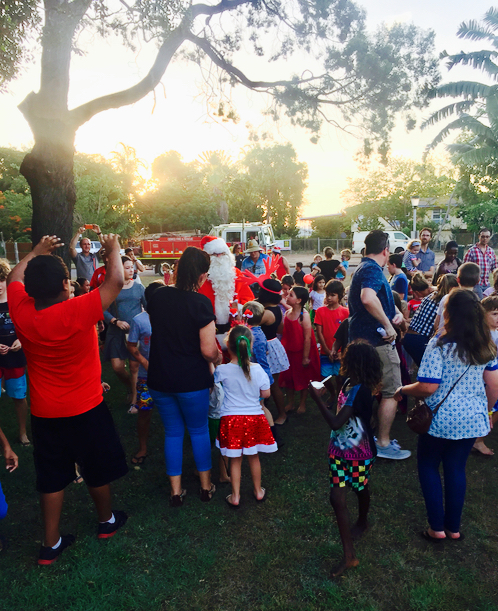 Yep, that’s right… Santa made the trip to Groote Eylandt, despite the heat! The kids had a ball all afternoon. As I looked around I saw children of all ages from the teeniest babes being fawned over to the dancing tweens and teens having an awesome time and being free to just enjoy themselves. I sat with friends and watched our kids dance on the stage with no thought for anything else but singing the Christmas Carols at the top of their lungs and busting out the awesome moves. I saw how well the children in the community know each other and how easy and comfortable it was. I watched as Santa arrived and a gaggle of kids tore out of the fenced area to chase the fire engine around the street… and no one was worried about it. It was awesome. I also saw the adults that worked very hard to pull off the best event they could. A lot of people worked tirelessly for the days and weeks leading up to that event and I am so thankful that we have people who are willing to do that in our little community… and we have quite a lot of them. It’s not just the Children’s Christmas Party I am referring to now either. We have volunteers running events for the kids left, right and centre here, from an ever growing BMX club that the kids talk about non stop, to MyGolf and Family fishing comps. From Auskick to playgroup, from Net Set Go to Craft workshops run by the CWA. And this is just a small list. And I guess the reason why I am writing about all of this is that I am very thankful to be part of a community of people where there are so many who are willing to pitch in and make the community strong, especially for the kids. A lot of us do miss family and friends while we are living here. It is an amazingly beautiful place, and a fabulous place to live, but it is still ‘far away’. The people who run these events (and I hope they know who they are) help to make that distance seem just that little bit less, in my opinion, and at this time of year particularly, I am very thankful for that! So to anyone in our little town that has contributed to any of the amazing family events, no matter how big or small, this year or any other, I extend my sincere thanks and appreciation. You guys truly do rock! Kelly on Groote Eylandt – One for the Ladies! rachpbye on Crocodiles, Hats and Book Week Fun! 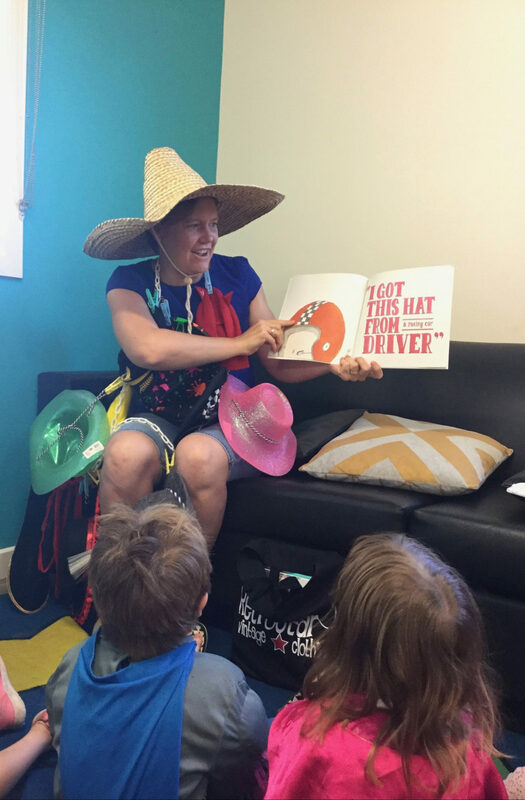 Stephanie on Crocodiles, Hats and Book Week Fun!